I'll be the first to admit I'm not ultra crafty. A project has to be somewhat simple for me to fully accomplish. I've never tried my hand with glass blocks but have seen some beautiful decor made with them. 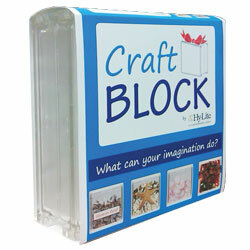 Acrylic craft blocks are a durable, lightweight alternative to traditional glass blocks. Hy-Lite® offers durable acrylic block Craft Blocks for both children and adults to create imaginative, unique gifts and decorations. The lightweight clear wave acrylic blocks are made in the U.S.A. and offer a safe, break-resistant way to create projects for all ages. Each Craft Block comes in a standard eight-inch by eight-inch square size and is three-inches wide. 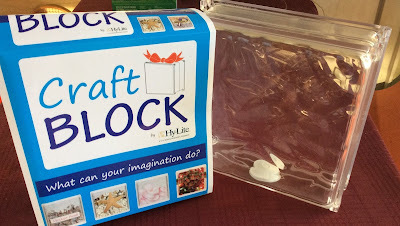 The blocks are fitted with a one-and-one-half-inch sized access holes and have a reusable rubber seal, making it easy to add items inside the Craft Block. There are many things that can be made with a Craft Block, including memory boxes and banks. If it can fit in the access hole, it's good to go! I went to the Dollar Tree and purchased a variety of fake flowers, along with dragonfly accessories. I also bought purple string lights and glass pebbles. Jason and I worked on the project for about an hour, and was able to complete it in that time. 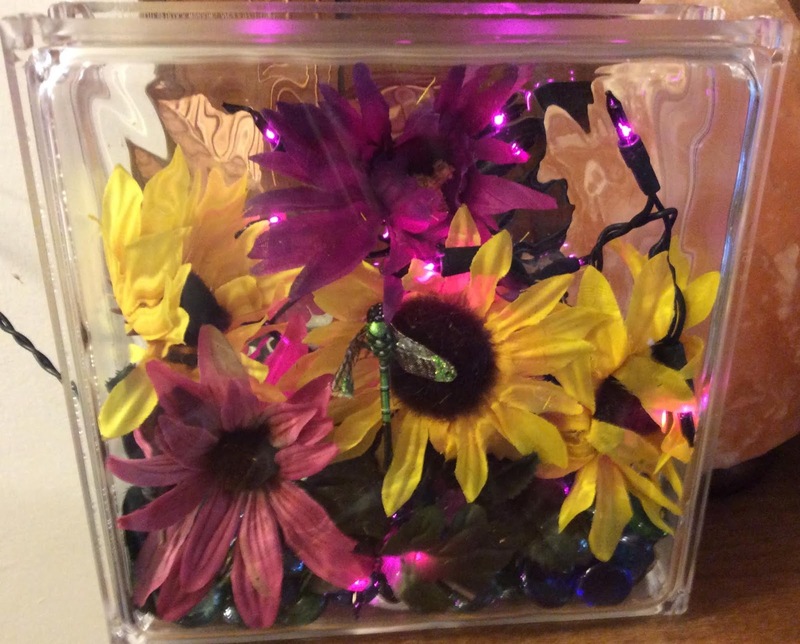 We used a long, hard plastic straw to push the flowers in the Craft Block and position them where we wanted. Then we added the glass pebbles, dragonfly, and lights. When everything was in as desired, I closed the rubber seal. Because the seal completely covered the opening, I cut a slit in the seal so the end of the lights would hang out. That way, I can plug them in when I want. We had a good time with the Craft Block and now have a nice piece of decor added in the living room. The Craft Block possibilities are endless. I received products for review from Hy-Lite. The opinions within this post are of my own and I was not influenced in any way. Please do your own research before purchasing products or using services. Your opinions and results may differ. This is a great idea for the girls to make. They can design it themselves. We sold them last year at the store I work in. I didn't know what you can do with them. That came out beautiful.